A MUST HAVE for all pet owners. 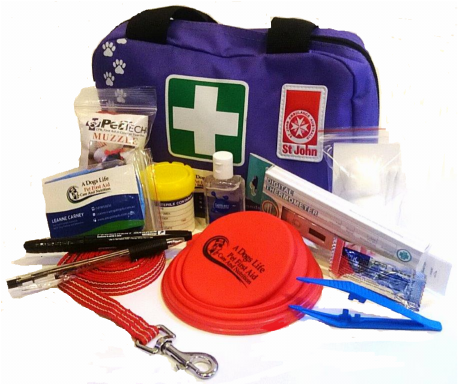 Complementing the St John Pet First Aid Kit it provides all the necessary items to be prepared for any emergency for your pet. All items fit securely into the St John Pet First Aid Kit or can remain in the clear Zip Lock Bag for easy access. Please note: These items do not come with the St John Bag pictured. The bag is for display purposes only. A Dogs Life has partnered with St John, a name that is trusted and synonymous with First Aid. The items in the Pet First Aid & Emergency Kit have been carefully researched and selected to provide any Pet Owner the resources to best deal with any Pet Emergency.